"There are haunted places in the world, all existing in reality and every bit as tangible and accessible as the house next door. Sometimes it is the house next door." In this brilliant debut collection, Ian Rogers explores the border-places between our world and the dark reaches of the supernatural. The landscape of death becomes the new frontier for scientific exploration. A honeymoon cabin with an unspeakable appetite finally meets its match. A suburban home is transformed into the hunting ground for a new breed of spider. A nightmarish jazz club at the crossroads of reality plays host to those who can break a deal with the devil . . . for a price. With remarkable deftness, Rogers draws together the disturbing and the diverting in twenty-two showcase stories that will guide you through terrain at once familiar and startlingly fresh. Ian Rogers is a writer, artist, and photographer. 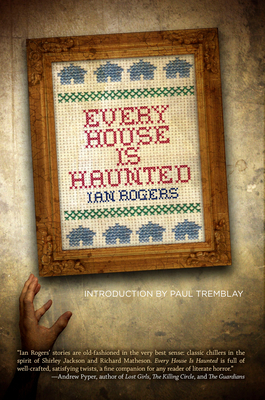 His debut collection, Every House Is Haunted, was the winner of the 2013 ReLit Award in the Short Fiction category, while his novelette, "The House on Ashley Avenue," was nominated for the Shirley Jackson Award, and was optioned by Universal Cable Productions. His short fiction has appeared in several markets and has been selected for The Best Horror of the Year and Imaginarium: The Best Canadian Speculative Writing. Ian is also the author of SuperNOIRtural Tales, a collection of stories featuring supernatural detective Felix Renn. Ian lives with his wife in Peterborough, Ontario.